Utah-based Purple is a company that specializes in what it calls “sleep and comfort technology”. In addition to mattresses, it also manufactures cushions, pillows, platform bases and sheets. Like many new mattress companies that have sprung up in the last half decade, Purple is an e-commerce, direct-to-consumer venture; one of several that drives the current mattress-in-a-box craze, only it doesn’t actually come in a box. 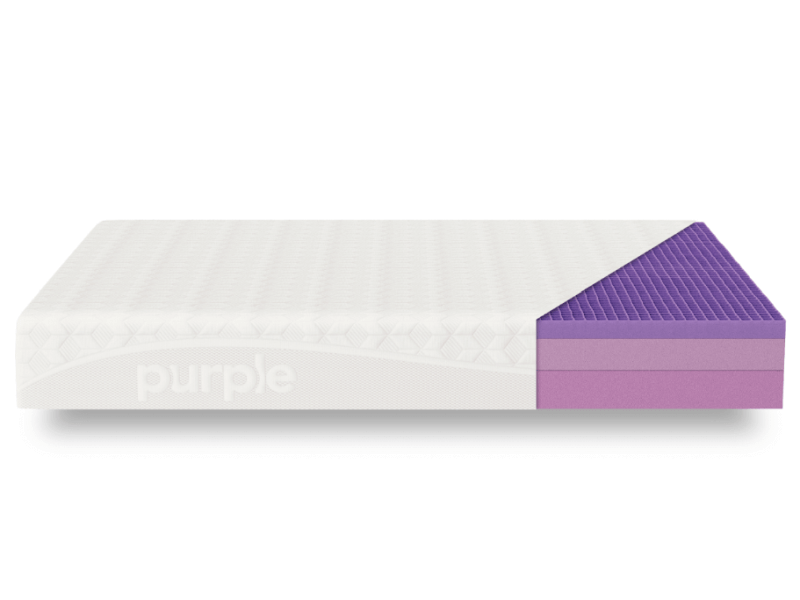 The Original Purple’s design remains one of the most unique of the new crop of trendy, “one fits all” mattresses that now dominate the industry. The mattress is made using materials and construction conventions unlike any other, with the unusual variations supported by patented research. Purple manufactures and assembles all the mattresses in Utah; all manufacturing products and packaging used are recyclable, too. The Original Purple mattress is constructed simply—it really is just three layers of different materials wrapped in a fire retardant sock and then encased in a white, zippered mattress cover—but don’t let this be a letdown. When it comes right down to it, the hype and attention that the Original Purple mattress enjoys can be attributed to one thing: the two-inch top layer of patented hyper-elastic polymer that’s built with a grid-like design. The first layer is purely a hyper-elastic polymer made from FDA certified food-grade products; and is an antimicrobial, hypoallergenic and recyclable material created to handle and release pressure. When combined with the grid formation, the material provides extreme cooling and comfort, as well as firm support without stressing pressure points on a sleeper’s body. This layer is what makes the construction of the Original Purple mattress different from that of any of its competitors’ offerings. A powder coating made of polyethylene copolymer is present on this top layer too, to prevent the hyper-elastic polymer grids walls from sticking to each other, especially while the mattress is compressed, packaged, in transport or in storage—we’ll discuss this more later. The middle and bottom layers are both made out of CertiPUR-US approved polyurethane foam. The center, transitional layer is three and a half inches thick, and is meant to provide additional compression support to the mattress. The denser, foundational layer is a little thicker at four inches, and is meant to be the base of the mattress, giving the upper two layers support and the entire mattress its shape. Overall, this construction provides great pressure, great support, and great bounce; and a lack of motion and heat transfer. The fire sock is a fabric knit that is typical for its kind, and seems to be both sewn and glued on. It serves a mechanical purpose and is not chemically treated. The mattress cover is light, stretchy and breathable; made of a Polyester, Polyester-Lycra and viscose fabric blend. It seems to work well with the top layer of the Original Purple mattress; its stretchiness allows the grid design to work its “no pressure” magic, and its breathability heightens the cooling effect. Although there is a zipper sewn into the mattress cover, Purple recommends using a mattress protector and only doing spot-cleaning when needed. Washing the mattress cover may cause it to shrink and therefore fit differently over the mattress, potentially limiting the performance of the product. Now, back to the plastic powder that is present on the top layer of the mattress. Purple states that it is food contact-grade and non-toxic; and has recently sued an online mattress reviewer—Honest Mattress Reviews—questioning the veracity of those claims. Purple claims that the mattress reviewer is not only spreading misleading information; but is also “in bed with” Purple competitor GhostBed. As this is a developing story, this current situation will not affect Good Night’s Rest reviews in any way until the situation is resolved. For more information on the case, you can read the case’s September 2017 preliminary injunction. It is available in only five standard US mattress sizes: twin XL, full, queen, king, and California king. It is a little thinner than average at only nine and a half inches; and surprisingly above average in weight. To illustrate the point: The twin XL Original Purple mattress weighs 70 pounds, which is also the weight of a queen-sized Leesa mattress. Like most mattresses with multiple layers, the Original Purple mattress should not be flipped, though it doesn’t hurt to rotate it every six months or so—and because the mattress cover doesn’t come with handles, the weight could pose a problem. What kind of structure will support the Original Purple mattress properly? Of course, Purple recommends its own platform base; however, it’s not a requirement. All you need is a firm, flat, sturdy, non-spring and solid surface. Platform bases, inflexible and straight slatted bed frames, box foundations and even the floor will work fine. However, it’s worth mentioning that you really need to be particular and meticulous about this selection if you want warranty coverage to be unquestionable; for instance, if you use a bed frame with a queen-sized bed, the warranty specifically states that the frame must have more than four legs. Another point of mattress support and maintenance is the use of a stretchy and breathable mattress protector—this is also suggested in the warranty text. When you purchase an Original Purple mattress, shipping is free, but delivery can take time. Currently, the product website assures that orders ship within three to five days of purchase; but there has been a history of long wait times and backlog in the relatively short time that Purple has been around—typically due to high product demand. If you are in a hurry and in desperate need of a mattress right away, this may be worth considering. 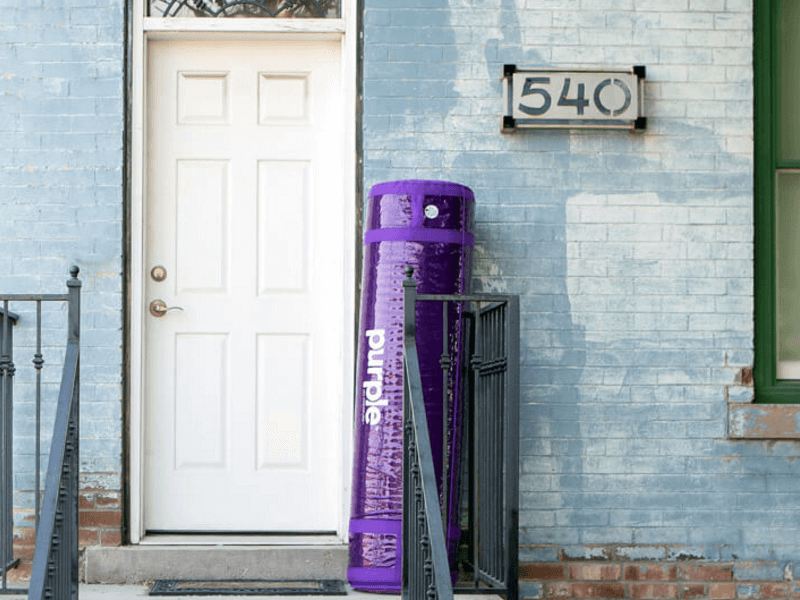 Unlike many online mattress companies, Purple doesn’t ship you a mattress in a box with cut out handles; instead, it comes rolled up inside a sturdy vinyl tube with very useful, built-in handles that you can use to carry it into your house. Although the mattress is heavier than its counterparts, this packaging style does help alleviate the main hurdle of setup and assembly. Speaking of setting it up, you can wait about a month before removing the Original Purple mattress from its packaging; longer than that and you may encounter problems with decompression and shape. Once the Original Purple mattress is unwrapped, it expands within minutes. Again, due to its weight, it may be a good idea to do this on the intended bed frame or foundation; also worth mentioning here is the fact that the mattress is rolled up with the top layer facing out, so there is a tendency for it to expand positioned upside down. You can flip it once it’s fully expanded, or just unroll it top layer up. You can use the mattress right away once it’s set up. There may be a faint and slightly sweet “new mattress” smell; but no strong scent usually associated with off-gassing, especially because the Original Purple mattress contains no memory foam. Purple states that their Original Purple mattress easily supports 600 pounds total, or the equivalent of 300 pounds per side. The company further assures that every sleeper, regardless of weight, should find a measure of comfort on a Purple mattress. However, significantly heavier regular users may cause the mattress to soften faster, and therefore eventually alter the product’s supportive capabilities. An examination of the reviews left on the product website shows that the Original Purple mattress is positively received for the most part. Negative reviews are few and far between; typically complaining about too much firmness or setbacks in delivery times. Worth mentioning here is that many positive reviews also mention an adjustment period of days—sometimes weeks! Some sleepers find the Original Purple mattress not comfortable at all in the beginning, until their body and sleeping posture adjust to the unfamiliar design. Original Purple mattress owners are also typically very passionate and vocal about their love for the product, which—while not scientific or empirical proof of a superior mattress—is always a great indicator of potential customer satisfaction. Speaking of potential customer satisfaction: Another problem area for this new company is its reputation, as it simply hasn’t been around long enough for any third party or anecdotal evidence to support durability, long term safety and usable life span claims conclusively. What Purple does have, though, is a great track record when it comes to customer support—although it doesn’t offer live chat, which would have been the icing on the cake. Also, as we’ve previously stated, it’s had some difficulty with product availability, waiting periods, and lawsuits. Worth noting, however, that Purple did start as a crowdfunding darling; which likely did much for the company’s initial positive impact. Purple offers a “no pressure guarantee” with each mattress purchase, which consists of a trial period and a return policy with a full refund. You can sleep on the Original Purple mattress for 100 consecutive nights from the delivery date—a duration that is quickly becoming an online mattress purchase standard—which more than makes up for the fact that you are, in essence, flying blind by purchasing the mattress without testing it first. Purple recommends that you give yourself at least 30 nights to adjust to the Purple mattress. What happens if you want to return the mattress? It’s as easy as contacting the company about the return. Purple will then arrange for the mattress to be picked up, and their customer support representatives will even help you find a local charity that may want to receive the mattress as a donation. If there isn’t one available, the mattress will go to recycling facility. Once Purple receives and verifies the donation or recycling receipt, you will be issued a full refund. If you don’t return the mattress and decide to keep it, make sure that you take care of it well. 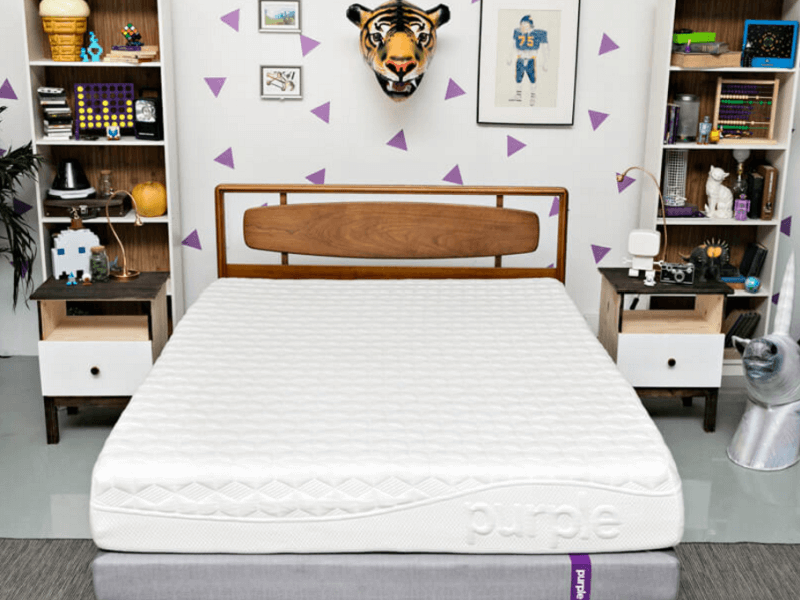 Unlike some of its competitors, Purple says outright that the usable lifetime of its mattress is 10 years, which is why the warranty covers the same period. The 10-year warranty it comes with has many conditions—some of which we’ve enumerated above—so it’s worth reading more than once. As of this writing, the queen-sized Original Purple mattress is available for $999. 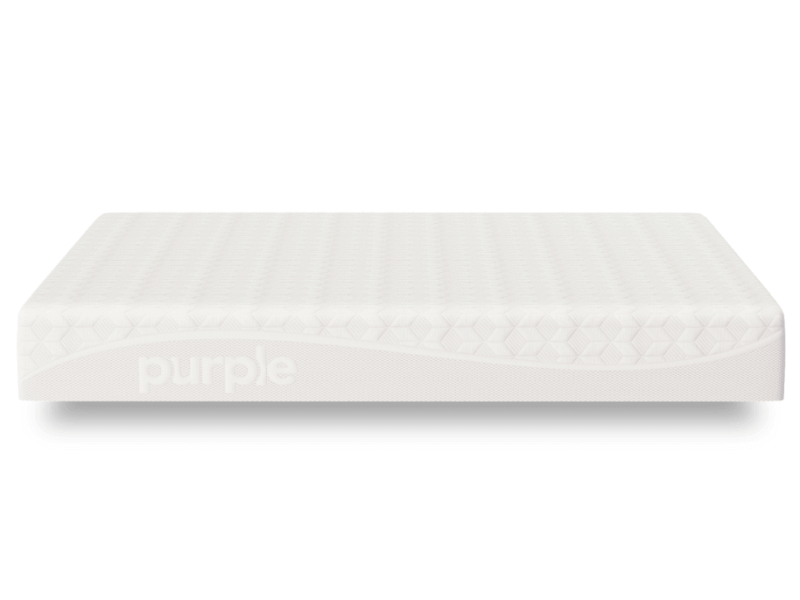 Occasionally, Purple also offers discounts or even additions of its other products for every mattress purchase. The Original Purple mattress is not a traditional choice by any means; and even with its 100-night trial and 10-year warranty, purchasing it still entails risk. Its design is completely new and unfamiliar beyond and even at times within the mattress industry, and some patents are still pending for some of the materials and construction conventions that go into the mattress. Not even a year and a half since its launch in early 2016 and it’s already embroiled in a complicated lawsuit involving one of its proprietary materials. However, one can’t ignore the almost cult-like following Purple mattresses inspire in its most passionate and satisfied owners. If you have a heart for adventure—or if you are in dire need of a mattress with great support for pressure points—it’s worth getting the Original Purple mattress, if only to maximize the trial period.